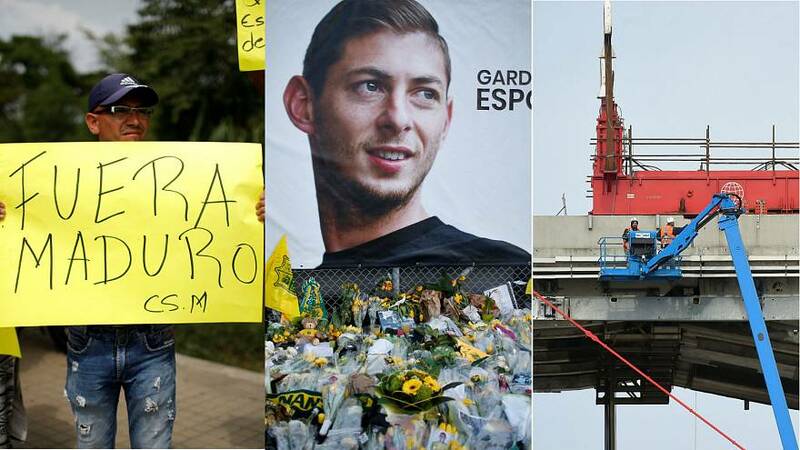 A body recovered from plane wreckage in the English Channel is that of professional football player Emiliano Sala, said Dorset police in a statement after it was brought to Portland Port, Dorset, on Thursday. Authorities recovered the body on Wednesday amid "challenging conditions" after it was first spotted in the plane's wreckage on Monday. "The body brought to Portland Port today, Thursday 7 February 2019, has been formally identified by HM Coroner for Dorset as that of professional footballer Emiliano Sala," the statement read. The move came a day after France denounced an "unacceptable" meeting between Italy's populist deputy prime minister, Luigi Di Maio, and France's anti-government "gilets jaunes" (yellow vests) protesters this week. Demolition work has begun on the Morandi bridge in Genoa in Northern Italy, six months after it collapsed. The motorway bridge gave way in August last year, killing 43 people and forcing hundreds of others to leave their homes. A two-year guaranteed basic income trial in Finland failed to spur the unemployed to work more and earn more as was hoped, according to researchers. The country's government published the first findings from the trial, which ended a month ago, on Friday. During the experiment, 2,000 unemployed Finns became the first Europeans to receive a monthly pay cheque from the state, regardless of whether they found work or not. They were given €560 tax-free from January 1, 2017, to December 31, 2018. Social media giant Instagram has announced that it is banning all graphic images of self-harm from its platform as part of efforts to “support and protect the most vulnerable” users. The move comes after the father of British teenager Molly Russell said the site was partly to blame for her suicide in 2017. He explained that following the 14-year-old's death, the family found distressing material about suicide and depression on her account on the popular photo-sharing app. “We will not allow any graphic images of self-harm, such as cutting on Instagram – even if it would previously have been allowed as admission,” Instagram Head Adam Mosseri said in a blog post on Thursday.